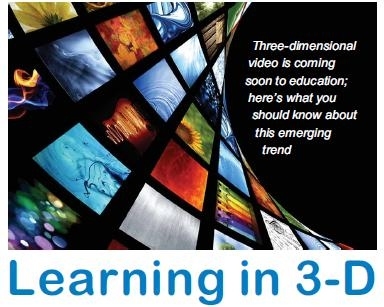 Learning in 3-D: Three-dimensional video is coming soon to education! Three-dimensional video is coming soon to education; here's what you should know about this emerging trend. Learn about Texas Instruments "DLP 3-D Classroom Ecosystem"
The automobile, moving pictures, personal computers, cell phones, and social networks—all of these technologies, once considered frivolous, have made such a huge impact on our culture that our daily lives would change dramatically without them. Could 3-D video be next? It’s a question made relevant by new improvements (and falling costs) that soon could make 3-D video commonplace in theaters, homes, and even schools. Owing to rapid advances in technology, 3-D video already is taking cinema by storm—and mainstream use of 3-D video in the home and elsewhere isn’t far off. What’s more, advocates of 3-D video say it has the potential to revolutionize the way students learn. Approximately one in every three digital theater screens in the United States is equipped for 3-D video, according to the report “3-D TV: Where Are We Now and Where Are Consumers,” by David Wertheimer, CEO of the Entertainment Technology Center at the University of Southern California, and Shawn DuBravac, adjunct professor at the George Mason University School of Business. According to the report, once given a taste of 3-D video, “consumers show significantly higher interest in viewing additional movies in 3-D and potentially buying and viewing 3-D in their homes.” Of those who have seen a 3-D movie in the last year, 60 percent are willing to spend more on a 3-D television for their home, and 19 percent are willing to spend up to 25 percent more, the report says. 3-D video is on the cusp of becoming mainstream, says the report. And with mainstream adoption imminent, education is soon to follow, says Phil Lelyveld, program manager for the Consumer 3-D Experience Lab at USC’s Entertainment Technology Center. 3-D video isn’t actually new to education; for years, it has been used in advanced research projects at colleges and universities, such as immersive virtual-reality environments. Iowa State’s Virtual Reality Applications Center (VRAC), for example, has been on the leading edge of 3-D technology since 2000. That year, the VRAC opened the C6, the first six-sided immersive virtual-reality system in North America. The C6 is a 10-foot-by-10-foot room in which computer images are rear-projected onto soft vinyl screens on all four walls, the floor, and the ceiling. To meet the VRAC’s resolution requirements and support stereoscopic viewing, four projectors are stacked vertically for each surface, reaching about 10 feet high. Images from two of the projectors blend together to make up a 4,096-by-4,096-pixel right-eye image, and the other two projectors provide the left-eye image. To get the full immersive experience, users of the C6 use active-shutter glasses to see the images in 3-D, and they interact with the virtual world by using gloves, wands, and a variety of haptic devices. These devices are linked to the system via wireless communications. So far, biologists have used the C6 to “shrink” themselves down to cellular level and experience a 100-million-pixel virtual cell simulation, partially funded by National Science Foundation (NSF) grants. The military also uses it to train for combat. But such high-end 3-D applications typically cost several hundred thousands of dollars. Now, Texas Instruments (TI) has developed a 3-D chip that works with standard Digital Light Processing (DLP) projectors, bringing 3-D technology to the masses—and at prices that are comparable to those of other XGA and SXGA projectors. That has many people excited about 3-D’s potential to facilitate teaching and learning. “As educators, we all too often are required out of necessity to make students take three-dimensional concepts and try to learn them in a two-dimensional perspective. This disconnect creates a gap in learning between those who naturally can map back to three dimensions and those who can’t,” said Stan Silverman, professor at the New York Institute of Technology’s School of Education. 3-D video creates the perception of a differential between two slightly offset images when viewed by each of two eyes. By presenting each eye with a slightly offset or different image, a projection system or display can create the illusion of depth. The 3-D images seen in today’s movie theaters typically rely on separate projectors for the left-eye and right-eye images. The polarized light from these projectors is filtered and projected onto a special screen that preserves this filtering upon reflection. Viewers wear inexpensive, “passive” glasses that either block the polarized light or allow it to pass through, depending on the type and degree of polarization. TI’s new 3-D technology uses just a single DLP projector, and no infrared emitters, polarizers, or special screens are required. Viewers wear special “active shutter” glasses, which electronically open and close liquid crystal lenses over each eye, synchronized with a 3-D video display. Through a communication protocol known as “DLP Link,” the DLP chip in the projector sends a flash of light in the transition between left-eye and right-eye images, and the glasses—recognizing this encoded white signal—sync to the image. So when a left-eye image is presented, the lens over the right eye closes, and vice versa. This process occurs more than a hundred times per second and is virtually undetectable to the user, resulting in a seamless image that appears in 3-D. So far, roughly 15 projector manufacturers have adopted TI’s 3-D technology. There are 35 projector manufacturers that use DLP technology in all, and TI’s DLP division shares its technology, which includes 3-D capabilities, with all of these companies. One of the manufacturers that now offers 3-D-ready projectors is BenQ. Alvarez said 3-D-ready projectors are a wise investment for educators. Although the projectors themselves are available for purchasing now, 3-D content for the classroom is another story. As of press time, there was only a limited amount of K-12 educational content available in 3-D, though content developers are working on producing more. Hirsch, a tech-savvy leader whose district is near the forefront in technology and achievement, said that while there is some 3-D content available now—all of it high quality—it’s sparse and mostly deals with high school science subjects. Tim Beekman, president of SAFARI Montage, a supplier of on-demand educational videos, said 3-D content providers are working to develop science and math content, but 3-D video created solely for education has many characteristics that need to be thought through, and this will take some time. Beekman explained that content can’t be rushed, because the quality needed to create educationally relevant classroom materials can’t be compromised. Beekman, however, takes a more cautious view of 3-D’s role in education. “I see it as a vertical market, because there’s just so much that has to be in place for 3-D to go right, such as glasses, glasses maintenance, high-end laptops with high-resolution graphics cards, new projectors, specialized content, and specialized lighting. My guess would be that only specialized tech science labs would use 3-D heavily, and it might be another two years before this happens,” he said. 3-D video glossary To help you better understand the terms and technologies associated with 3-D video, eSchool News has crafted this 3-D glossary. Here are some of the many 3-D capable DLP projectors on the market today. Still, with so much potential for 3-D video to help students learn, and with prices for 3-D projectors no more expensive than comparable 2-D models, educators have nothing to lose by “future-proofing” their classrooms, projector makers say. That’s just what Colorado’s Boulder Valley School District has done, purchasing more than 1,000 3-D projectors from Vivitek Corp. for mounting in every classroom. The district, which spans 500 square miles and has 28,000 students in 51 schools, has always been an early adopter of technology, according to Len Scrogan, director of instructional technology. Another district that is trying out 3-D video is Illinois’ Rock Island/Milan School District No. 41, which has been working with a series of 3-D math simulations called Classroom3 (”Classroom Cubed”), from JTM Concepts Inc. The simulations have shown early promise in helping students learn how to compute the volume of complex shapes. A key argument for investing in 3-D projectors now, despite the scarcity of K-12 content so far, is that 3-D projectors using TI’s DLP Link technology also function normally as 2-D projectors without any image distortion. Hirsch’s district has been using the same DLP projectors since 2000. Plano has 2,100 projectors in classrooms throughout the district, and, according to Hirsch, in the last nine years only seven projectors have broken and needed maintenance. TI’s DLP division provides a graphic for educators, showing what it calls “The DLP 3-D Classroom Ecosystem.” The ecosystem consists of everything a teacher will need to take advantage of 3-D video in the classroom: a computer, 3-D projector, active-shutter glasses, and 3-D content from providers such as EON Reality, RM Education, NEOTEK, SAFARI Montage, Discovery Education, and Promethean. So far, the available content includes frog dissections, a walk-through of famous architectural structures, animations of the human body in detail, topographies, and a fly-through of the universe. Sound Video Systems, maker of the AVRover brand of portable audio-visual systems, has partnered with BenQ to release the AVRover 3DSVS24, which the company says is the “first fully integrated 3-D Stereoscopic Educational System.” The product is a portable and rugged 3-D AV system with all components securely mounted inside. It features a powder-coated, scratch-resistant steel console, as well as a 3-D projector from BenQ and sequentially numbered active-shutter glasses, storage, and sanitation for an entire class. It lists for $7,895. SAFARI Montage has partnered with AVRover and BenQ to provide 3-D content to educators who decide to purchase the system. While most of the SAFARI content is not yet available, Beekman says it will be soon. According to AVRover and BenQ, 3-D classroom components must meet very strict standards in order to be sustainable. For example, eyewear must be robust, easy to operate, sanitized after use, have a continuous-use battery life of six hours or more, and fit the faces of students ages four through 18. And everything must be easy to use. Wudeck noted that AVRover’s eyewear-cleaning box is a convenient solution, and he said “little things like this” can really help a district when switching to 3-D.
Having content readily available might encourage more educators to make the switch to 3-D-compatible projectors, although Wudeck said educators already are lining up to future-proof their classrooms with or without content. “Once the pilot programs get running, we’ll start to get data about how kids remember … and understand content better when they see information in 3-D,” said Dave Duncan, worldwide education business development manager for TI. Like Wudeck, Duncan believes that white papers and case studies from 3-D pilot programs will be available during next year’s major tradeshows.